Here's the Christmas Tree mini that I made for my mom as a table topper. I'm happy to have gotten it done in time to deliver at the Christmas Eve dinner party last night. This one was also my December ALYoF goal. These four orphan blocks came from a guild sale maybe ten years ago. They spent a long time deep in my stash and resurfaced when I got organized over a year ago. The project has been a low priority WIP on the list for the past five quarters. Since it's a holiday project I was motivated to get it done now, instead of letting it sit around for another year. At the SCVQA 40th anniversary party I won a few fat quarters of Christmas fabric. 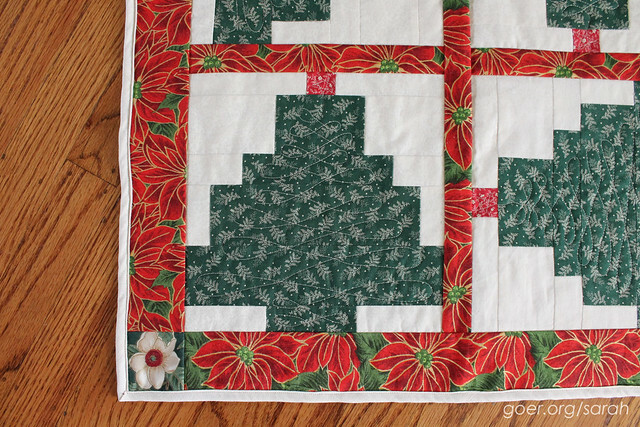 I used the poinsettias here for the sashing and border, but didn't have quite enough, so I fussy cut the flowers on the green fabric for the corners. The backing and binding were both stash fabrics. It has simple quilting, just on the trees. Overall the table topper measures about 22" x 22". 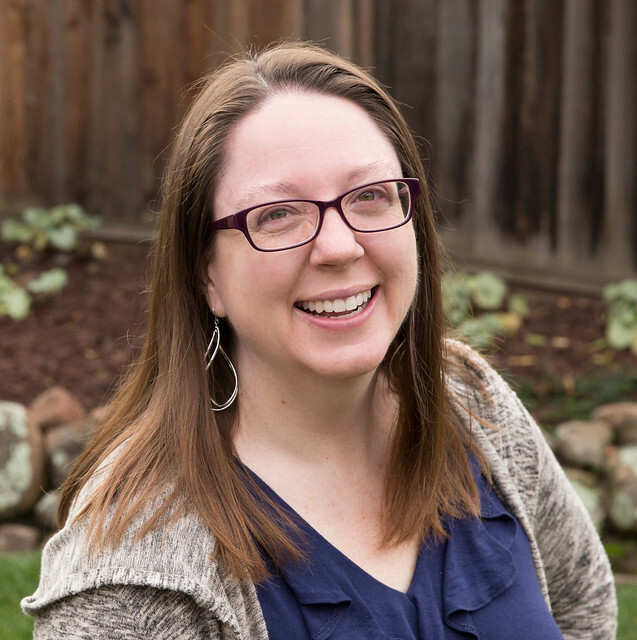 I'm linking up to ALYoF December Finishes Party and Adrienne's 2015 Q4 Finish Along post. See all my Q4 goals here. Thanks for visiting! Posted in Quilting. 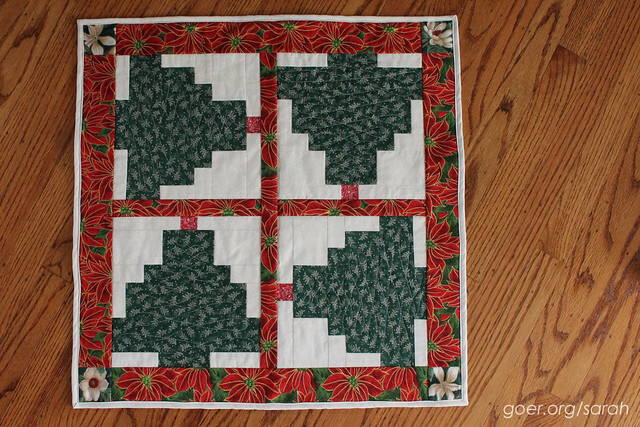 Tags: ALYoF, finished quilt, mini quilt on December 25, 2015 by sarah. Congrats for achieving your ALYOF goal. Thank you, Anja. Probably my second oldest WIP, so that feels great! 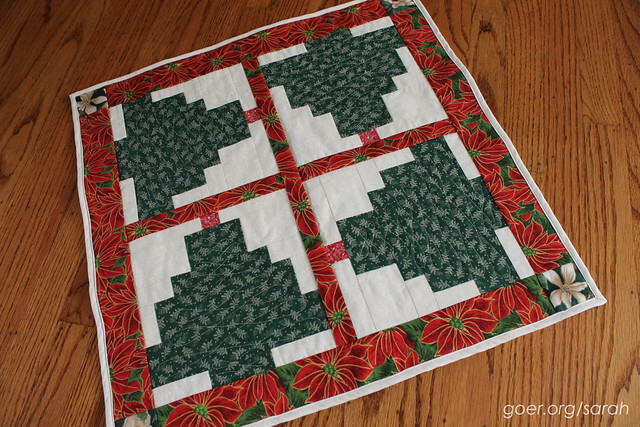 I really like this Xmas quilt! !